There is something about being in the outdoors and experiencing all that nature has to offer, weather you are an avid watcher, photographer, or hunter of animals one the most exotic in the United States is the blackbuck antelope also known as the Indian antelope. These majestic looking antelopes originated from the regions of India, Nepal, and Pakistan. The most stunning characteristic is the long ringed horns the males have, however, females have been known to grow horns. The coloration is also striking as they have white fun on their chin and around their eyes which brings attention to the black stripes along the face and in turn the coats of the male of the species is a dark brown to back which is highlighted beautifully from the white that is around the midsection and down the legs. The females to tend to be brown or fawn color. The blackbuck antelope has a lineage that has been passed down to them from gazelles. 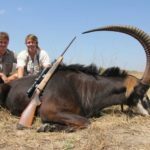 There are many places in the United States if you are wanting to do some blackbuck antelope hunting. The species were introduced in Texas and has grown quite significantly since 1932. There are also game hunts you can go own in Missouri and Tennessee just to name a few places to look into for unique hunting experiences. There are places that are designated for hunting the prices can vary depending on the size of the animal and what all is included in the experience. The prices can range from two hundred a day per person to get to hunt along with transportation around the reserve, meals, and guides. This usually is what you would pay to get started and upon harvesting of your blackbuck could vary between $1750.00 up to $3000.00. There are some however for the larger price its all inclusive you get your guide, meals, lodging, transportation, and also the harvesting of your award winning trophy blackbuck. There are even some that may have rivers nearby that when you are not hunting you can be trying to land your trophy sized fish as well. The blackbuck antelope is usually hunted year round as well. If you are an avid hunter then you will already know that stealth is your best friend. The blackbuck antelope are very timid creatures, one wrong snap of a twig and they will be off to the races, they can reach speeds up to fifty miles per hour. The best way to hunt them is using a blind and camouflage, stalking can be done but it is so much harder because of the keen sense of sight and hearing these animals have. The need for large caliber rifles is not necessary either when hunting the blackbuck, a simple .243 is adequate firepower for this smaller game. The blackbuck antelope needs water and will go a very long way to get it, these watering holes would be great places to set up a blind or stakeout from atop a hill looking down just ensure that you are deliberate in your movements and slow.